This post is sponsored by Bosch – as always, all opinions are mine. I am SO EXCITED to share our kitchen with you!!! One of the main goals of the remodel was to open up our home and make our space work better for us. With three young kids and a love of hosting friends and family, our kitchen really is the heart of our home and I’m absolutely obsessed with the end result! When we were designing this kitchen, I gravitated towards a few things that I think are on-trend now but will have strong staying power. 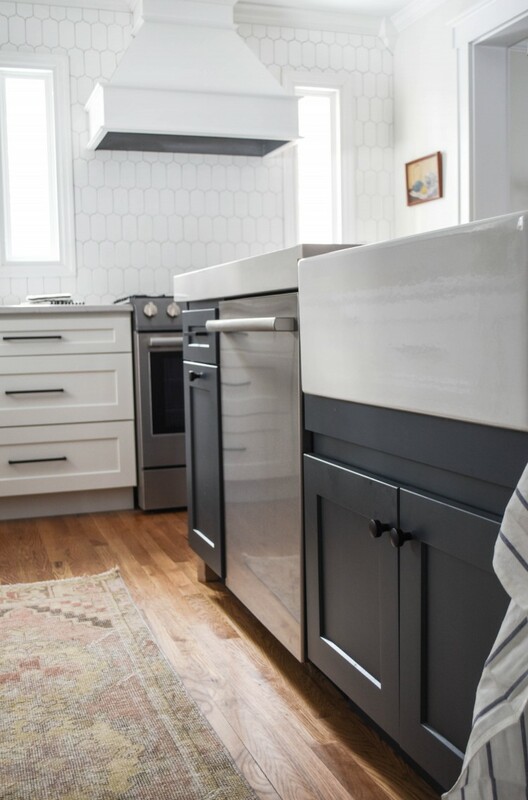 My goal was to create a kitchen that’s light, bright, and classic – without being boring. White shaker cabinets. White cabinets are classic but they’re also EVERYWHERE right now. Big farmhouse sink. Another piece that’s classic but also hugely popular. White backsplash. Classic color but I went with a unique shape because I feel like white subway tile is in every other house now. And the one MAJOR trend I didn’t follow… exposed shelves. Not because I don’t love them! But because I think they will date the kitchen as the years pass. NOTE – if you have exposed shelves, AMAZING. I do love the look but it just didn’t fit with our house and storage needs. I literally say to Chris once a day, “I REALLY love this kitchen!”. And I truly do. It just feels like a space that’s perfect for our family and feels like home, but better. My search for appliances actually started when I asked via Instastories which brands to avoid and which were worth the money. The overwhelming majority of you said Bosch dishwashers are the absolute best, hands down. So I reached out to Bosch to collaborate and they generously gifted me our oven, dishwasher, fridge, and microwave. DREAM COME TRUE! 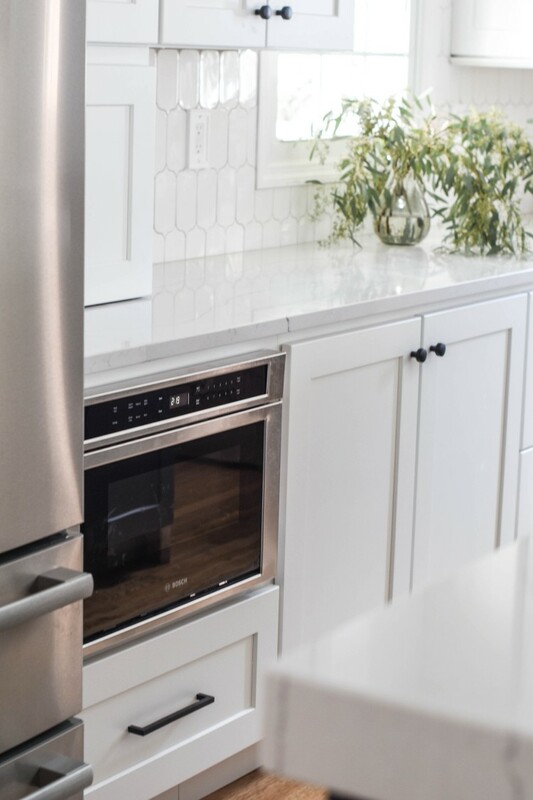 It’s one of the quietest dishwashers you can buy – SO important when the kitchen is right next to the family room! Fingerprint-resistant stainless steel – no tiny smudges all over the front. Winning! There’s a third rack that’s super versatile and adds 30% to the loading capacity – amazing for silverware and tiny bottle parts. I love the retractable shelving to fit tall items and the adjustable in-door shelving. They have a Dual AirCool system to provide even temperatures – the temp at the door and at the back of the fridge are the same! No freezing or warm spots. It also minimizes odor transfer between the refrigerator and freezer. I’ve never had a drawer microwave before and I love the way it looks! It’s surprisingly big – you can fit a 4-quart casserole dish inside. 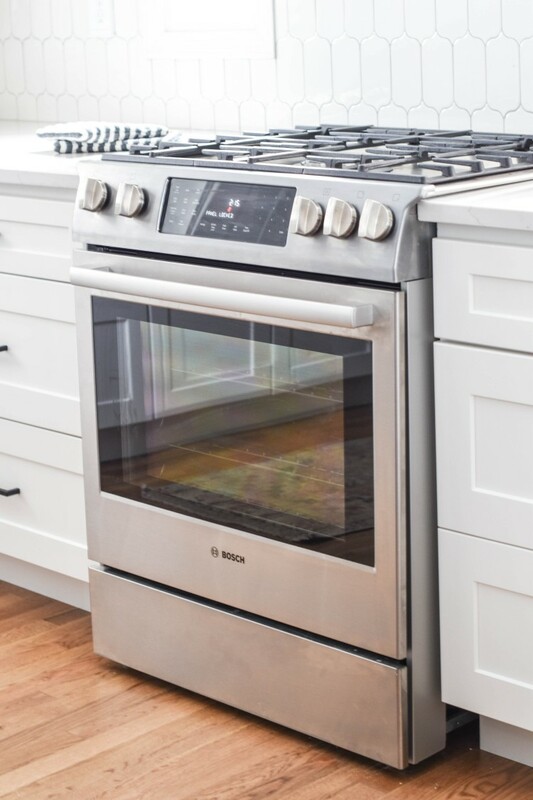 I definitely wanted a gas cooktop but an electric oven – this is the best of both worlds! You’ve probably heard of ‘convection’ but Bosch uses European Convection, which guarantees even cooking no matter what level the rack is. It’s got a built-in meat-probe that automatically shuts off the oven when the goal temp is reached – SO cool! I’m in love with the fast pre-heat option that preheats the oven QUICKLY – a must in my house! So, basically, the Bosch appliances are amazing, full of useful features to make your life in the kitchen easier, and they’re also gorgeous. I’m really looking forward to sharing more with you! Now on to the rest of the kitchen reveal! the view from the family room into the kitchen – I love all the natural light! another view from the family room into the kitchen – we wanted the fridge near the door to our backyard so snacks would be easily accessible 🙂 the dutch door is SO fun, the kids love it! I love the bridge faucet in the island. We opted to put both the sink and the dishwasher in the island so you can be in the middle of entertaining but still prepping or cleaning without having your back to guests. I *really* wanted an oven with a decorative range hood and I’m so happy with it! we chose this blue island color – Cadet Blue – and the color is a perfect mix of grey and navy, hopefully a timeless choice! and my new vintage turkish rug – all the heart eyes! this sink is what farmhouse dreams are made of! navy blue kitchen island – timeless or trendy? hopefully timeless! 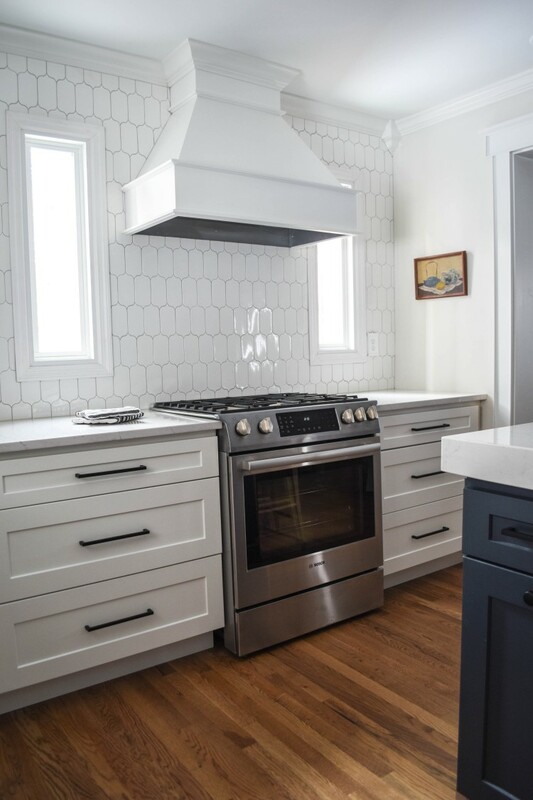 the backsplash has a fun, almost feminine shape – I was going to use white grout and at the last second switched to silverado and I’m so happy I did! What do you think of our new kitchen? The Gift & Home Stuff You Need from the Nordstrom Sale + a Giveaway!